If you are taking blogging as a series career then finding reliable hosting should be your first priority and finding reliable host does remain a major problem for bloggers. Because we know a bad host can destroy our site. We all want our blog should remain 24/7 online and that's why it is important that quality web host company should be hosting our site or blog. Today, I'm sharing hostgator reviews with you. Before writing hostgator web hosting review I just wanted to let you know, I've personally experienced its services and taken poll from my colleagues too to know their point of view and I must say you can rely on HostGator hosting. What is hostgator ? Well, it is the web hosting providing company founded in 2002, which let you host you website or blog. It also provides shared hosting, reseller hosting, virtual private server (VPS) hosting and dedicated web hosting. HostGator comes in world's top 10 web hosting providing companies. It has already hosted 8 million+ domains and counting. They offers you 45 days money back + 99.9% uptime guarantee. All 3 plans are popular because of there own functionality. Hatchling plan allows you to host only one domain while baby plan allows you to host multiple domains. So, if you have only one blog to host you can definitely go for hatchling plan but if you have more than one blog to host you can try baby plan which is my favorite. Business plan has some more additional functionality and features. The feature's list are endless. You can find comparison between all 3 plans [www.hostgator.com/shared-compare] and select which ever suit for you most. One thing I mostly like about hostgator is their technical support. If you are new in blogging and don't know how to host your wordpress site to hostgotor, you will get complete help. You will also get excellent help when you're transferring from any another host. Their live chat and telephonic support is available 24/7. You can call on this toll free number anytime :- 866-964-2867 ! You can buy hosting either for 1 month, 6 months, 1 year, 2 years and 3 years. You can buy hosting as per your comfort. 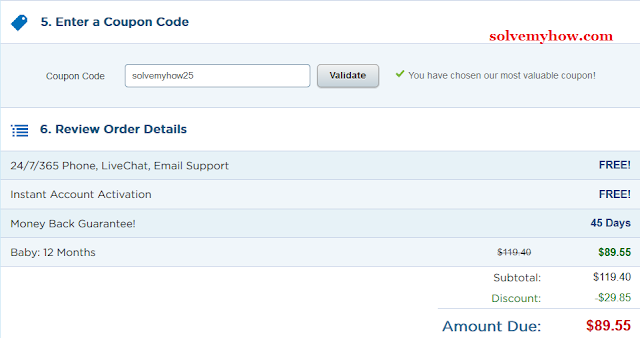 HostGator normally offers you 20% discount and with SolveMyHow you can get 25% discount on your final bill. 1 year baby plan hosting with hostgator cost you $119.40 but with SolveMyHow by using hostgator discount coupon (SolveMyHow25), it cost you $89.55. So, you got around $30 off simply by using "SolveMyHow25" coupon. Similarly if you wanted to try free 1 month premium hosting with hostgator use code (SolveMyHowCent). So, you just need to pay 1 cent for first month. I must recommend you to try "baby hosting plan" once, as you're getting 1st month free premium hosting + 45 days money back guarantee. Give it a try ! So, this was the complete review of hostgotor web hosting. Hope this reviews makes easier for you to decide which hosting plan you should buy. If you found this article informative, consider it sharing with your Google Plus, Twitter and Facebook friends so they can get help in buying web hosting plan. Do let me know your reviews about hostgator in the comments below.